Like many New Yorkers, I am a commuter. I take the bus to the train for a journey that will take about an hour and a half total. My bus travels past a beautiful woody area that includes a public park, bike trails and nature preserves all filled with wildlife that sometimes approaches the roads, narrowly escaping the wheels of a fast-moving stream of vehicles. Other times, wildlife is not so lucky. This susceptibility of wildlife to vehicular collisions is a big problem, but solutions are beginning to take hold in a variety of ways in many countries. As the owner of two small dogs that seem to be completely oblivious to oncoming traffic, walking them on a leash is not just the law, but an absolute necessity. All animals are experts at what they do, but most usually cannot navigate even the simplest of roads. And while I have never had any collisions with wildlife, many people are not as fortunate. According to the U.S. Federal Highway Administration, approximately 200 people are killed each year on U.S. roads due to vehicle-wildlife collisions. Twenty-nine thousand people are seriously injured in such accidents, costing more than one billion in insurance costs each year. Obviously, these collisions are taking their toll on wildlife as well. Millions of animals are killed on U.S. roads each year. In Southern Texas, accidents have reduced the number of an endangered cat, the ocelot, to about 80. And in Kenai Fjords National Park, Alaska, the number one predator of moose is the car. Imagine the impact of striking a deer on the highways of Germany where there are stretches of road with no speed limit. 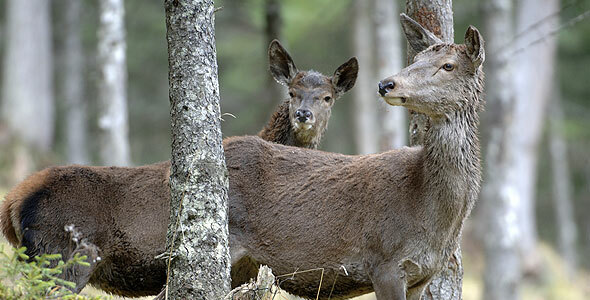 To reduce collisions and preserve wildlife, the German Federal Forest Administration works with landowners, communities and traffic authorities to create and maintain wildlife corridors. As of 2002, 32 ‘green’ overpasses had been built in Germany — the largest number in any country so far. Eight more were under construction and twenty more planned. In an attempt to ensure the survival of endangered animals, biologists are currently planning what promises to be Central Europe’s biggest conservation project to date. Working with transportation officials, they intend to build wildlife corridors to connect all of Germany’s major national parks. France was the first European country to develop green bridges for wildlife, in the 1950’s. As of 2000, nearly 400 structures for wildlife passage had been built including viaducts, bridges, pipe conduits, overpasses and underpasses. Like structures have also been built in Switzerland, the Netherlands, and Slovenia. Several similar projects have also been implemented throughout the United States. In Florida, the construction of road traffic bridges — extended farther than what is required by law — allows Florida panthers and other wildlife to safely cross underneath them. Large drainage pipes and box culverts in Virginia’s Great Dismal Swamp help to protect 21 species of snakes and 58 species of turtles, lizards, salamanders, frogs, and toads. And bobcats and coyotes are provided with enlarged underpasses in California, to name a few. Hopefully, with global adoption of programs such as these and others still to be created, the number of deaths and accidents among both people and animals due to wildlife-vehicle collisions will decrease substantially. As my bus expertly weaves through traffic, I realize just how intricate the network of roads, bridges and tunnels is here in New York. I am dropped off at my next commuting destination, the number 6 train, which will weave through a network of underground passageways designed for another kind of wildlife… New Yorkers!